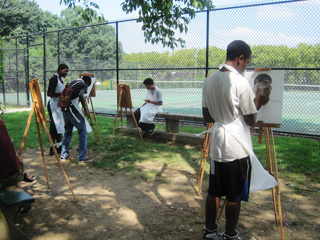 The following series of articles, created by the Parks Alliance, describes the current state of Philadelphia's parks. While many of our parks and recreation centers have made great progress and provide valuable resources and programming to the city's residents, they also face challenges caused by lack of adequate funds and maintenance. The following series of articles, created by the Parks Alliance, describes the current state of Philadelphia's parks. While many of our parks and recreation centers have made great progress and provide valuable resources and programming to the city's residents, they also face challenges caused by lack of adequate funds and maintenance. Full stories are listed below. With Philadelphia’s tightly-packed row homes and gritty urban character, it’s sometimes difficult to see William Penn’s 1682 vision of a “greene country towne.” But up in the far corner of Northeast Philadelphia, there is an historic plot of land—farmed continuously since Penn’s time—that still maintains this idealistic pastoralism. It’s Fox Chase Farm, a 100+-acre, fully-functional farm that hosts educational and community programming. 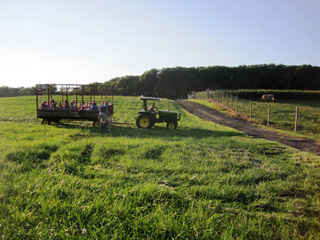 “To think that this is in the city, it’s amazing,” says Karen Eble, president of the Friends of Fox Chase Farm, as she gazes at the sun setting over the farm’s rolling fields. She is surrounded by a throng of families, all gathered for the evening’s open house, one of several times throughout the year when the farm is open to the public. 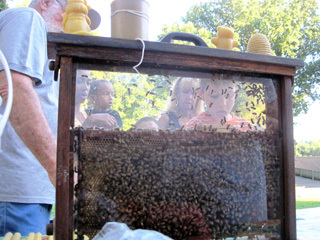 Tonight’s activities—hayrides, a petting zoo, and educational displays about beekeeping and herbal cooking—reflect the diversity of the farm’s programming, which encompasses nutrition, gardening, agriculture and animal husbandry. Nearly 20,000 people visit the farm each year. Half are students from surrounding school districts, attending field trips and lectures, and the other half come out for programs organized by the Department of Parks and Recreation, which include three open houses and three festivals each year. Many of these visitors, like 18-month old Aiden Gaudard, who plays in the gravel while waiting for his turn on the hayride, have never been on a farm before. “He really enjoyed looking at the animals,” says Gaudard’s mother, Krystyna, of Rawnhurst. The farm’s ability to expose youth to nature is one of its primary values. About 20 youth each year get an in-depth experience with animal husbandry through the farm’s 4H program, which pairs local youth with a barnyard animal to care for. In addition to teaching youth how to care for animals, the program builds character and leadership skills, says Eble’s husband Chuck Dickter, who helps run the program. While recollecting his years of experience with 4H, Dickter recalls many a poignant moment, like the time he watched one of his 4H officers give her valedictorian speech at St. Basil’s. “’If I hadn’t been president of 4H, I never would have been able to do this,’” she said. The community gets a window into the program during the “mini-farm show” open house each June, where the farm opens for the public to meet the 4H students and the animals they have raised. “It’s definitely our most populated open house,” says Karen Eble. The animals the participants raise are eventually sold at a real farm show and the money comes back to support the 4H program and the farm. There are other ways that people use Fox Chase Farm to give back. Food from the farm’s vegetable garden, which boasts tomatoes, eggplants, zucchinis, peppers and more, is donated to a local Jewish Community Center’s “Cook for a Friend” program, which delivers nutritious meals to frail or homebound seniors. If there is any produce left over, it goes to Philadelphia’s food bank, Philabundance. With disputes over small property lots common in dense cities such as Philadelphia, Fox Chase Farm’s 113 grassy acres seem too good to be true—and they almost were. Thirty years ago, developers threatened the farm, unleashing a major dispute with the City of Philadelphia and the local community. The developers had constructed an apartment complex in Abington, the suburb just across the border with Fox Chase, where the rear portion of the farm is located. But the access road was to branch off Pine Road, in Philadelphia. Locals who supported the farm were not keen on turning over the land to developers, and neither was the city, which delayed the process long enough for the developer to drop the case. Still, the farm wasn’t completely free from worry after this significant triumph. Tragedy struck in 1997 when a fire consumed the livestock barn, and once again, the community rallied. Seeing the unique value in the farm, the school district chipped in to repair the barn’s roof—and decided to make another major investment in the farm by building a brand new educational center. Now, the education center, which boasts bathrooms, a spacious classroom, and a small cafeteria, is frequently booked with educational programs for local students. The farm provides a dynamic and interactive learning environment that is hard to achieve in a classroom. 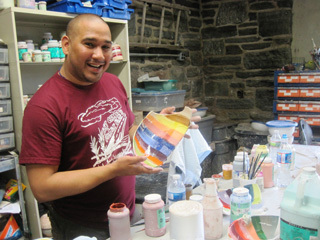 For more information about Fox Chase Farm, visit www.foxchasefarm.org. Look around at the summer camp taking place in Carroll Park and the scene is deceptively normal: children and counselors in bright shirts speckle the green square acre, throwing a football, making bracelets and playing duck-duck-goose. This is the twelfth summer that the free camp, run by the Christian ministry organization MFuge, has come to Carroll Park. The park shares its name with its neighborhood, a predominantly African-American, working class enclave in West Philadelphia. But the scene hasn’t always been so idyllic. Doris Gwaltney, head of the Carroll Park Neighbors, thinks back to the camp’s first day in 1999 and recalls a scene that more resembles a stand-off in a Western. Over the last twelve years, the camp has provided a much-needed service to the families of Carroll Park—children can get exercise and socialize while parents get a break from the constant need to come up with summertime activities for their children. The counselors benefit as well. The volunteers, who come from churches and organizations throughout the country, pay to travel and volunteer for one week in a far-off city—oftentimes one that bears little resemblance to their own. Along the way, they learn about another culture and get a first-hand look at the issues facing inner city residents. The place where these two groups gather to find common ground is literally the ground on which the camp takes place—the park. And cut loose they do—look around and you’ll find campers and counselors engaged in a smattering of activities, including basketball, sidewalk chalk, arts and crafts and double dutch. It’s more than activities, though. Just as the camp has come a long way from its uncomfortable first moments, so Carroll Park itself has metamorphized since the Carroll Park Neighbors took root in 1998. “During the late Eighties, drug dealers and prostitutes owned the park, and the city had abandoned it,” says Gwaltney, recalling deplorable conditions like a large sinkhole in the center of the basketball court and a spray pool wall covered in graffiti. Thirteen years, over a half million dollars in capital funding from various sources, and countless hours of hard work later, the Neighbors have built a new playground, installed a brand new facility shed and bathroom, and transformed the park into a safe, clean place where people from the community eagerly gather. In fact, every Saturday for the rest of the summer is booked with meetings, picnics, family reunions and fundraisers. Carroll Park has indeed done that for its community, which now flocks to the park it once avoided. But even with a half million dollars of support, which far exceeds the average amount of support for other Philadelphia parks, there are still issues that need to be addressed at Carroll. Next to the playground, a four-foot-square pit of dirt and rubble poses an imminent hazard to the children that run back and forth. The swings have been removed from the swingset because of a long gash in the rubber matting. The spray pool sits idle, having been inoperable for the last five years. The paint on the “Welcome to Carroll Park” sign is chipped and peeling. Revitalization is an ongoing process, says Gwaltney: “Once a park is revitalized, you need timely maintenance and the help of volunteers.” Without that necessary investment, problems like these crop up and never go away. But the Department of Parks and Recreation’s budget has remained stagnant since the Seventies while other city departments have grown exponentially. In spite of making full use of their meager allotment, the Department simply can’t provide every park with the support it needs. At Carroll, Department-financed Seasonal Maintenance Attendants cut the grass and take out trash every two weeks, but it’s hardly enough to keep the entire park safe and functional. So the spray pool remains broken; the swingset stays off-limits; and the safety hazards persist. “Until the Department is funded adequately, parks won’t get what they need,” Gwaltney says. And neither will people. People, after all, need parks—something that’s evident when observing the campers, who are getting exercise, developing social skills, and experiencing nature. If the park receives the resources it needs to be clean and usable, it will continue to be a place for Carroll Park residents to gather, learn, grow, and prosper. We know that parks positively affect people. Citizens gather there to learn, exercise, play, picnic, and experience nature. But how do parks affect the natural environment? Especially in a bustling urban area such as Philadelphia, they can be a major key to a cleaner, greener and healthier environment. Take Mount Airy’s Cliveden Park. Enter the one-square block park from any side and you will be struck by its natural contour—hills slope downward from the street, covered in old-growth trees, into a natural valley. This topography profoundly affects the park’s influence on its surrounding environment. The Philadelphia Water Department noticed the land’s unique layout, and decided to launch a project there to improve storm water drainage. Water that runs off parallel Johnson and Cliveden streets down into the park is routed into a system of cascading stone basins. The water flows over each step, creating a system of waterfalls, which naturally cleans the water while filtering it back into the ground. It feeds a series of interspersed gardens, brimming with wildflowers. The result is that none of the water from those streets enters the sewer system, while clean water nourishes aesthetically-pleasing plantings in the park. “The project allows us to essentially erase the footprints of those two streets in terms of storm water management,” says Joanne Dahme of the Philadelphia Water Department. It is one of over 225 projects across the city that the Water Department has implemented to reduce storm water runoff and flooding while nourishing parks and trees. They range from small improvements, like a planting that collects water from a downspout, to large undertakings like the creation and maintenance of a wetlands area. But these projects don’t just benefit the environment. They benefit people as well—by providing an opportunity to educate citizens about the natural environment. This is one of many educational opportunities available at Cliveden Park. There is also a regular tutoring program for local school children, where kids can receive free instruction in any school subject three nights a week at the park’s handsome stone facility building. 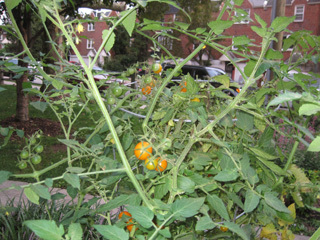 Well-maintained vegetable gardens surround the building, sprouting squash, tomatoes, and peppers. They are tended by a weekly garden club, whose members harvest the bounty and share it with the local community. In terms of recreation, the park contains playgrounds, a picnic area, and hilly walking trails. But the setting wasn’t always so immaculate. It was once fraught with turmoil and challenges—a time that longstanding residents Vicky and Gertrude Berks remember well. In the 1960s, the construction of new apartment buildings spurred the influx of new residents, pushing gang activity off the streets. The park still struggles with an inadequate lighting system, a problem which the Friends Group is currently trying to raise funds to fix. Fifteen years ago the group was granted a 50 thousand dollar grant from the Pennsylvania Horticultural Society, which it used to remove dead trees, plant new trees and grass seed, and come up with a master plan for the park’s future. The Horticultural Society guided the group through the process of organizing the master plan, a three-year project which involved community input gathered at a series of meetings. The result was a greatly improved park, with updated amenities and improved maintenance. While the park is night and day from its troubled early days, there are still problems that plague it, some of which are caused by its unique topography. The hilly side bordering Cliveden Street, in some spots bare and in others covered by overgrown thicket, has been a primary issue. Collaborative efforts like this are telling of the current political climate regarding support for Philadelphia’s parks. As funds for many other municipal departments have grown steadily, the Department of Parks and Recreation has struggled with a deeply inadequate budget for decades. While the Department provides what it can—including Seasonal Maintenance Attendants to do much-needed trash removal and mowing—Friends Groups look to their communities and other organizations for support. The challenges are ongoing, but Lewis is content when he looks back on a legacy of progress. It’s a hot Sunday night in July and hundreds of people are gathered in the “bowl” area of the lower part of Clark Park in University City. The 9-acre park is one of the largest and most highly-used pieces of open space in West Philadelphia, and tonight, it’s also a theater. The Shakespeare in Clark Park group is rounding out their last performance of the summer’s run of Much Ado About Nothing. Elizabeth Emma of Washington D.C., a University of the Sciences alumna, returned to her old neighborhood to see the production. “It was fabulous, so much fun and creative,” she gushes about the production. She is equally effusive about the park itself, which is in good condition after recent renovations. But Emma hasn’t forgotten what the park was like when she was a student. “When I lived here 25 years ago, Clark Park was public urination and drug use,” she recalls. Despite its location in University City—a bustling area east of Center City home to a lively business district and several upper-tier universities—Clark Park hasn’t been without its share of problems. “It got pretty bad in the eighties and even into the early nineties it was kind of a mess,” remembers Frank Chance, immediate past president of the Friends of Clark Park. But no matter how bad it got at times, the park was never disowned by its community, which organized into various groups over the years to watch over it. 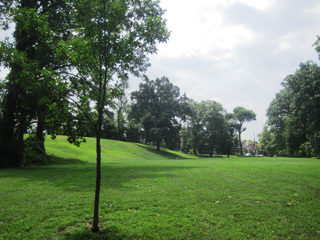 An historic piece of land which once housed the largest hospital in the world during the Civil War, Clark Park was established in 1895 in the name of Clarence H. Clark, the wealthy banker and developer who had donated the land to the city. No stranger to intelligentsia—the University of Pennsylvania is mere blocks away—Clark Park is constantly presided over by a life-size replica of one of history’s great literary figures, Charles Dickens. The statue was originally destined for London’s Hyde Park but landed in Philadelphia, the home of its sculptor, after a scholar pointed out that Dickens’ will stated, “make no monuments to me.” Now the neighborhood has an annual celebration on Dickens’ birthday, February 7th, with the 200th anniversary coming up in 2012. A different type of cultural event—the rock concert—became common in the bowl area during the 1970s. But when the concerts—and the crowds they attracted—got too loud and rowdy for the community, the Friends of Clark Park formed in 1974. One of the oldest friends groups in the city, the Friends of Clark Park remains as active as ever today, overseeing everyday usage and maintenance, as well as large projects like the recent renovation to the park’s upper section. “That made the park 100% better,” says Megan Steiner, who came with a friend to see Much Ado About Nothing, of the renovation. Completed in June 2011 after 6 months of being closed to the public, the renovation completely revamped the upper section of the park, just across Chester Avenue from the bowl. A month before Much Ado debuted, members of the Department of Parks and Recreation, Water Department, Friends of Clark Park and other entities gathered, giving speeches, cutting a ribbon, and ushering the public back into an impossibly green, beautifully landscaped and barely recognizable reincarnation of their beloved park. It wasn’t a quick or easy road to reach the nearly perfect appearance of the upper park today. Frank Chance recalls an effort that took years and marshaled the support and expertise of a wide array of players. Half of the funds for the renovation came from the Department of Conservation and Natural Resources and half from the city, while the Friends of Clark Park raised all of the money for the design of the landscaped gardens along the park’s periphery. It’s rarely easy to raise significant funds for an improvement project—especially one that will shut down the facility during maintenance. But one visit to the park will reveal its importance, says Chance. “You only have to go there on a weekend afternoon and see how many people there are to know how important it is to the community,” he says, describing the multitude of activities—both organized and casual—that take place in Clark Park on any given day, from soccer and volleyball to chess playing and dog walking. Then there are the festivals, flea and farmer’s markets, reunions, sporting events and parties, some of which draw crowds of thousands. But heavy use means accelerated decay, and the park has struggled to keep up with its maintenance needs, says Chance. 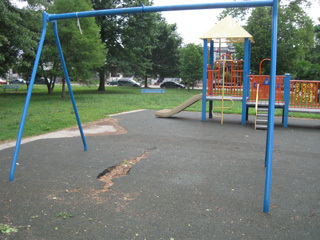 As much is evident in the lower section of the park, where sidewalks have begun to crumble and grass has started to wear thin, despite a full renovation 20 years ago, and a renovation of the playground and basketball court in 2008. The most obvious issue is a sizeable patch of bald ground at the bottom of the bowl where any interruption—be it a golden retriever or a Shakespearean actor—kicks up a massive cloud of dust. To keep pace with these challenges, the University City District, a non-profit consortium of organizations working together to improve the neighborhood, has built park maintenance into its budget for the first time in 2011. Chance isn’t being pessimistic, but realistic—funding for parks and recreation hasn’t been in the city’s priorities in decades. The department’s budget hasn’t budged since 1970, even adjusting for inflation. “I would love to see the city invest 100 thousand dollars a year in the Department rather than 20 or 30,” says Chance, who dreams of a day when all of the park’s maintenance is done by the Department, freeing up the University City District to spend money on other things, like special events in the park. The park’s wish list also includes maintenance that is more skilled and specialized, says Chance. Currently the landscaping maintenance the city funds is provided by contractors rather than specialists dedicated specifically to one piece of land. But, he contends, the Department still supports the park as best it can. As it stands, though, “one employee is full time only in the summer and we’re at the usage level where we really need someone full-time year round,” Chance explains. Because that’s how often the park is used—full-time, year round—and no matter the challenges it faces, the park is sure to make history well into Philadelphia’s future. Sitting in the Roots Community Garden in Fisher Park—a tranquil green oasis with wildflowers, a picnic table and a rustic fence covered in vines—it’s easy to forget you’re in Olney, a highly diverse neighborhood in North Philadelphia. The 5000-square foot garden is one of many amenities at Fisher Park, a 23-acre park on North 5th street, a major thoroughfare in Olney. The park also boasts a football field, tennis and basketball courts, playgrounds, a facility building with classrooms and a ceramic workshop, and wooded trails. But wander out into the woods along the trails, which are littered with trash, broken glass and moldy clothes, and it becomes easier to remember that you’re in a major urban area—one that often lacks the resources to take care of precious assets such as parks. “We’re a little broken, but we’re working on it,” says Laurel Sweeney of the Friends of Fisher Park. Before Dean, Sweeney was the constant presence. “Literally I’ve been at it, hammer and tongs, for 15 years,” she says. After all, someone has to do it. Like many parks around the city, Fisher has had to cope with shrinking attention as the budget for the Department of Parks and Recreation has flatlined for nearly 40 years. Where there was once a year-round, full-time city worker dedicated solely to Fisher, now the park receives part-time seasonal maintenance from April to October. This leaves it to Dean, Sweeney and other volunteers to spend their free time making sure the park remains an asset to the community. But Sweeney isn’t blaming the Department. In fact, they do the best with what they have, she says, which isn’t much. Still, with the department’s meager budget, parks such as Fisher are left with mounting wish lists of tasks that they simply do not have the time, money, or expertise to complete. It wasn’t long ago that Fisher had many of its wishes answered. 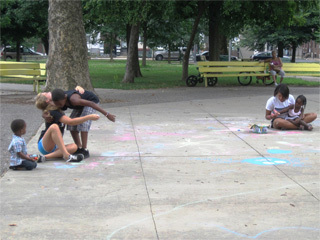 In 2007, the park underwent a large-scale renovation, funded by the Department of Parks and Recreation and the Department of Conservation and Natural Resources, which included resurfaced tennis courts and new basketball courts, fences and lighting. But the problems that persist—broken glass, rugged pavement, swampy ground, overgrown trails, and littered woods—are proof that regular maintenance is just as important as occasional renovations. Muggings and drug use were a common sight, and community members stayed out. “There were not a lot of people in here. You felt lonely when you walked through,” Dean remembers. The park is no longer lonely; rather, it’s a flurry of activity. Young girls jump double dutch near playgrounds teeming with kids. Young men shoot hoops. Families gather for picnics, reunions and quality time. This transformation owes to diligent efforts by many groups, including the Friends of Fisher Park, the Department of Parks and Recreation, and the East Oak Lane Tree Tenders. But, under everything, Sweeney says it was rooted in one simple principle. The reasons to keep a park in good condition are many, and Fisher is, in many ways, an ideal representation. For example, the park serves as an interactive indoor/outdoor classroom. 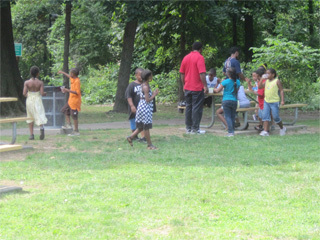 Local teachers use the park to expose students to nature and teach lessons about ecology. Those interested in the topic can use the park for further study, like students from the Grover Washington Science Club, who transformed the woods into an arboretum for a recent project, identifying trees and marking them with species labels. Young artists gain inspiration from nature as they participate in the annual visual arts camp, a city-administrated private three-week summer camp where students experiment with painting, ceramics, screen printing and other skills. Now at three locations across the city, the camp had to expand beyond Fisher, its original location, when it exploded in popularity. For Olney, an “area at risk,” according to Sweeney, with a lower socioeconomic profile and struggling schools, the park is an especially important place for education and enrichment. And the benefits don’t end at children. With athletic courts and fields, picnic tables and hilly trails, the park is a place for exercise and recreation for teens and adults, as well. Perhaps most important is the park’s most obvious benefit: it provides a break in the hubbub of urban life, and an opportunity to be outside. A “meditation garden” in the woods lures wanderers with a bench surrounded by a peaceful canopy of trees, and the Roots Community Garden provides an equally serene place to relax. For Sweeney—and many of the residents of Olney—Fisher Park is their much-needed escape. For more information about Fisher Park, visit www.myfisherpark.com. As she sits in a lawn chair on the grass at Disston Recreation Center in the Tacony section of Northeast Philadelphia, Ruth Beaucheane, 90, recalls a lifetime of fond memories at Disston and neighboring Vogt Recreation Center. Tonight Beaucheane is one of many enthusiastic community members gathered at Disston for an installment of the summer concert series. Featuring five concerts throughout the summer, the series is organized by the Tacony Civic Association and hosted by the Recreation Center. 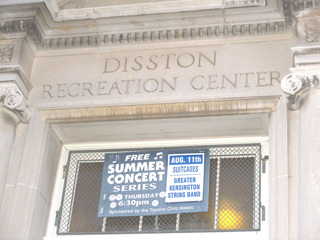 “Once summer hits, the phones don’t stop ringing with people asking, ‘When’s the next concert?’” says Disston Facility Manager Andy McGlocklin, who has worked in various recreation centers across the city for the past 16 years. He says he likes working in Tacony because it’s a tight-knit community. “We’re trying to keep the quality of life high,” adds McGlocklin, who is responsible for organizing the programming that occurs at the center, which includes youth soccer, women’s softball, basketball, martial arts, ceramics, and other community events. The two-story building also boasts a fitness center and computer lab. Disston and neighboring Vogt, which is larger and home to more amenities including a swimming pool, are two of over fifty recreation centers across Philadelphia that give residents a safe place to congregate, exercise and learn—all for free or little cost. Outside of small fees and donations from user groups, all the services at Disston are free of charge, explains McGlocklin. Unlike parks across the city, recreation centers have always benefitted from having in-house staff people such as McGlocklin. Still, when the Department of Recreation merged with the Fairmount Park Commission in 2008, parks weren’t the only facilities to reap the benefits. McGlocklin cites several positive effects of the merger, including having a dedicated maintenance person rather than one who travels between facilities. “Gerri, our maintenance lady, is vigilant,” says McGlocklin, praising her efforts to maintain a clean facility despite occasional vandalism and graffiti. She doesn’t have too many problems to contend with, though. A glance around Disston will reveal groomed lawns, adequate equipment and widespread use from the community. Only a few spots of graffiti and one rusted, torn cyclone fence show that Tacony is a neighborhood, like many other in Philadelphia, that faces challenges. The Civic Association sponsors events like the concert series in order to bring members of the community together to enjoy each other and their neighborhood. “It’s a very historic area,” says Woolslayer of Tacony. One of the oldest neighborhoods in Philadelphia, Tacony was an industrial-era hotspot that housed the Disston Saw Works, a large and extremely successful saw and file manufactory. It was also home to Pennsylvania’s first post office, established by William Penn in 1683. To celebrate this rich history, the recreation center hosts Tacony History Day each year, with games, old-time attractions and a history display in the gymnasium. With plentiful on-street parking, restrooms, and a well-lit, fenced-in outdoor area, the Recreation Center provides a great setting for a variety of community events. Like this evening’s concert, which is getting underway as nearly 200 people gather in the verdant field, watching the stage across the basketball court, which acts as an informal dance floor. Elderly folks, families with small children, and a group of special needs adults from a local home are spread out on lawn chairs, enjoying the music, provided by a folk foursome called The Suitcases and the main act, the Greater Kensington String Band. A few brave souls dare to dance, while teens throw footballs and Frisbees in the background and young children navigate the playground equipment. Inside, some young men shoot hoops in the gym, and a few people wander up to the computer lab to check their email. With the facility abuzz, it’s easy to see the value it holds for the Tacony community. Still, Beaucheane is quick to drive this home.